CAPE CANAVERAL, Fla. — It was a long time coming, but space shuttle Discovery finally blasted its crew of seven into a cloudless Sunday evening sky _ the first orbiter flight of 2009 to the international space station.Its mission: to provide more electricity to the orbiting lab. A month behind schedule, the mission has been delayed four times by fragile valves inside the shuttle's propulsion system. Then a hydrogen gas leak scrubbed Discovery's first launch attempt last Wednesday. But Sunday there were no signs of leaking gas, no hardware issues. Even Florida's fickle weather was perfect. The shuttle thundered into a clear sky, trailing a plume of pale vapor that turned bright pink as it caught the last light of the setting sun. The launch was made possible by NASA engineers who worked overtime Thursday, Friday and Saturday to fix the leak, giving astronauts a near-full mission. Delays did shorten the mission by a day to 13 days, and one of four spacewalks was dropped. That's because Discovery needs to leave the space station to make room for a Russian Soyuz spacecraft bringing new residents to the complex. Discovery's crew, which includes two school teachers, should reach the international space station Tuesday. They are commanded by Air Force Col. Lee Archambault. The crew are pilot Dominic "Tony" Antonelli, a Naval Cmdr., mission specialists, Steve Swanson, a computer engineer, John Phillips, a Navy Reserve Capt., Koichi Wakata, a veteran Japanese astronaut, and Joseph Acaba and Richard Arnold II, both teachers and first-time fliers. They're accompanying a 45-foot-long, 31,000-pound truss segment, the last U.S.-made piece of major hardware for the space station and the final section of station's "backbone" structure. 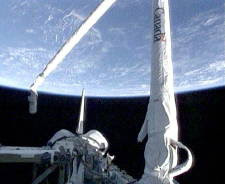 Connected to the truss is the last set of solar wings to complete the space station's power system. Once it was clear the unexplained gas leak had been fixed, preparations for the launch were smooth, but colorful, not least because a fruit bat had attached itself on the shuttle's external tank before takeoff. The bat clung to the backside of Discovery's tank, about a quarter to a third of the way from the bottom. Its presence forced NASA to run an "'engineering analysis" on the bat _ seriously _ just to makes sure that the small winged critter did not represent a threat to shuttle on launch. NASA officials said they expected it to fly away on its own when the engines began to rumble to life. They even saw it as a good omen: the last time a bat was attached to a shuttle was on STS 72 in 1996 and both the bat and the shuttle flew off safely. Coincidentally that flight was the first for Wakata, who is now headed to station for a stint as Japan's first long duration astronaut. But in a news conference later, Kennedy Space Center launch director Mike Leinbach suggested the bat did not survive its brush with Discovery. In response to a reporter's question, he said: "We are characterizing (the bat) as unexpected debris and he's probably still debris somewhere." The mission has been dubbed "Full Power" _ and that's what the astronauts hope to give the space station. Once Discovery reaches the station on Tuesday, the astronauts will start preparations to install the truss and solar panel. The $300 million truss segment is the 11th piece of the station's backbone, which will measure the length of an American football field when complete. The truss segment is nearly identical to its counterpart on the port side of the station, but includes some modifications to hold spare parts and some sensors to measure wear and tear. The two solar wings are made up of two sets of "blankets" which each hold 32,800 solar cells. They each span 115 feet in length and 38 feet across are now folded in boxes to a thickness of about 20 inches. When unfurled in space like giant shower curtains, they will provide more power to help the station support larger crews of six and conduct more science research. The first six-person crews are scheduled to take up residency on the station in October this year. But the job of unfurling the solar panels is not easy. Previous sets of solar panels have had problems like sections of the solar panels getting snags as they opened out to their full length, or they got stuck together and refused to unfurl. In the days waiting for Sunday's launch the astronauts who in charge of the installation watched videos of the spacewalkers studied videos of previous efforts to install solar electricity panels on the station. "It's something we take seriously because these two solar electricity blankets we're going to deploy have been in the box, one for five years, and one for eight years," said astronaut Phillips who will be operating the space station's robotic arm to help spacewalkers Arnold and Swanson install the wings. To make sure the wings open as planned the wings are stretched out slowly and allowed to warm in glow of the sun to loosen them up. In addition to getting the wings up and working, the mission's other objectives are to ferry a new part for the processor that turns urine into clean drinking water and to bring home U.S. astronaut Sandra Magnus after four months in space.